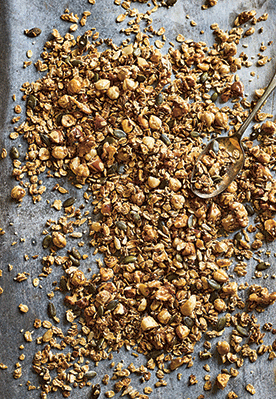 Homemade granola is one of the easiest, most satisfying things to make. It will keep for up to a month stored in an airtight container. 1. Preheat the oven to 200°C/gas mark 6 and line a baking tray with greaseproof paper. 2. Combine the oats, nuts and seeds in a bowl with the spices, then pour over the maple syrup and stir to coat. Spread out evenly onto the baking tray and bake for 8–10 minutes, or until golden and toasted. Remove and set aside to cool completely. 4. To serve, spoon some yogurt into the bowls, divide the granola and the compote on top. Finish with some fresh blueberries and blackberries and a drizzle of maple syrup.